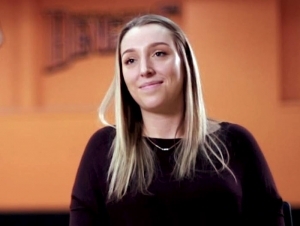 As a student at Marcellus High School near Syracuse, New York, Eimile O’Brien knew she wanted to play Division III volleyball in college. She was approached by both public and private schools and she visited a few. However, as soon as she stepped onto the Buffalo State campus, the choice was clear. She said she struggled academically in high school and was a little nervous about living away from home. She quickly acclimated to the college environment and has thrived. It’s a young team. When O’Brien started, there were 10 freshmen. They helped each other adjust to living in the dorms and excelling in the classroom as well as on the court. Originally a business major, O’Brien switched to economics and finance at the end of her first year. “I took Principle of Micro Economics and fell in love. The theory behind economics, the numbers, I really enjoyed all of that,” said O’Brien, who hopes to work as a financial adviser in the future. Her grades reflect her passion for the subject; she currently has a 4.0 grade point average (GPA) in her major and a 3.85 overall. Developing better study skills and playing an organized sport helped boost her grades from where they were in high school. In just two years, O’Brien has gained confidence from playing sports and serving in leadership positions, including on the executive board of the Student-Athlete Advisory Committee (SAAC). Recently, she was offered a position as a SAAC representative for the whole SUNY system. In addition, she’s gotten involved in a campus organization called Love Your Mellon, which sells beanies to benefit children with cancer. Once a year, the group invites one child in remission to campus for Superhero Day. She said she considers it every morning when she wakes up.